Winter themed Pictionary is an awesome family / party game for all ages - kids, tweens, teenagers and adults! Great for large and small groups, classroom parties, family gatherings and birthday parties! The game is easy to play and cheap too! All that is needed to play is players, paper (or a large pad and easel) and markers. The clues are provided below and free to print out for the game. One team member chooses a clue and draws a picture of that clue for their team members to guess the answer. 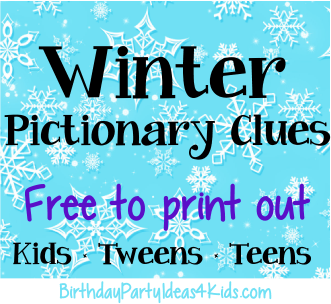 Print out the printable Winter Pictionary clues (below) and cut them into individual clues. Fold the paper so that the clues can not be seen. Place in a container. Give each team paper and markers or set up one easel with a large pad of paper at the front of the room. Divide players into 2 teams. Roll a die to determine which team goes first. The first team will select 1 player to draw for the team. The other team members will do the guessing. The player drawing will choose a clue from the clue container without looking at it. The player drawing for their team will have 5 seconds to look at the clue before their time starts. Set a timer for one minute. The player drawing will have 1 minute to draw the clue while their team members try to guess what they are drawing by shouting out their answers. They can not use any words or any motions. The team can shout out guesses until they guess what is being drawn. If they guess the clue within 1 minute they get 1 point. If they do not guess the clue within the 1 minute time limit then the opposing team has 1 chance to steal. The opposing team will have 10 seconds to discuss among their team the best guess for the word. Then they have 1 chance to get it right. If they guess the clue then they get 1 point. Play to 15 or 20 points or longer if time allows. Decide what the winning score will be before the game begins. Instead of two teams Winter Pictionary can be played with one person drawing until one player in the group guesses the clue. Then the player that guessed right is the next drawer. Fun winter themed charades with over 50 free clues!